Synopsis: Walter von Schönkopf and the Rosen Ritter, disguised as Imperial soldiers, are welcomed into Iserlohn Fortress. After a couple of close calls, they're brought to meet Admiral Stockhausen. After reminiscing on his past in the Galactic Empire, Schönkopf succeeds in taking the admiral's gun and holding him hostage. 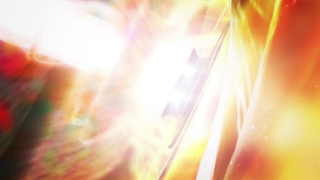 After sleeping gas is pumped into the air vents, the rest of Yang's fleet enter as conquerors, and use the fortress' Thor's Hammer cannon to destroy most of the previously deployed garrison fleet. 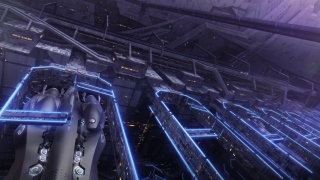 The Imperial forces withdraw and Yang's gambit pays off with the Alliance's ownership of the station. The Dominion of Fezzan, and its leader, Adrian Rubinsky, take notice of this event. Completing the adaptation of Chapter 5 of the first novel, this episode sees the FPA's 13th Fleet successfully carry out its mission to seize Iserlohn Fortress. It's a pretty straight forward adaptation, too, with very few changes or embellishments. The biggest departure is that the Rosen Ritters are taken directly to Admiral Stockhausen in the book, who is already so frustrated that he's let his guard down immediately when told that the fleet that went out was destroyed. Also in the book, Schönkopf brought in a ceramic gun, bypassing the only detector check, rather than a full body scan in this episode. Amusingly, the forged IDs he made were never even checked. The OVA has the soldier Schönkopf is playing as so injured that he's rolled in on a gurney for added effect (that also has weapons hidden in it). 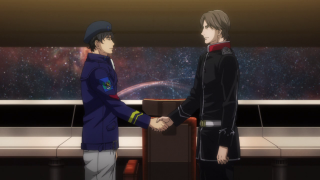 Iserlohn's commander surrenders almost immediately, rather than needing additional cohersion via the Seffle Particles. Also, there's more activity throughout the fortress, like a scene with the city section of Iserlohn and a rather bloody battle scene with axes. I guess the staff wanted to make it seem like there was a little bit more of a struggle to take the place. At the end of the OVA episode that covers this, Yang tries to resign, but is rejected, as the newly formed 13th Fleet needs him. What we do get in this version of the story is the introduction of the Seffle Particles. They're multi-use combustable particles and they're often deployed to prevent the use of energy weapons in a closed area or redirect objects in space. The Rosen Ritters use them to prevent the firing of guns in the control room of Iserlohn (though that kind of makes Schönkopf's use of the commander's gun sort of pointless). It reminds me somewhat of the Minovsky Particles of Gundam's Universal Century timeline, which are mainly used to block radar. I wouldn't quite call either special technology McGuffins per se, since neither franchise has stories revolving around them, but they are interesting story conveniences. They don't seem overly contrived in either case, but I just like to draw parallels. 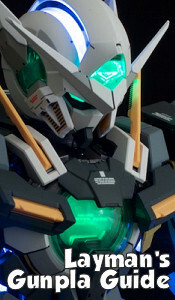 Maybe Tanaka was inspired by Gundam? I know a lot of people were/are. Even though it's only a short scene and we barely get a sense of the characters, we finally get to Phezzan, where we meet Landesherr Adrian Rubinsky and his aide, Nicholas Boltik. The Phezzani are, uh, a bit like the alien Ferengi from Star Trek, dialed down a little. They're consummate merchants who take pride in free trade and self-determination. They're the ultimate "the free market will solve everything" libertarian-types. Hopefully we'll see more of that in later episodes. It's interesting how they changed Rubinsky's character design, with a thinner, tanner face and those long sideburns (despite being otherwise bald). Boltik looks older than in the OVA. 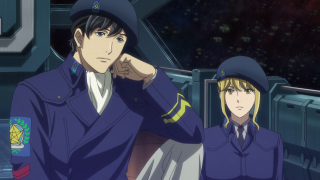 This was an excellent episode, though much of the quality was because of the core novel material and not necessarily this particular production (though I loved seeing some parts of Iserlohn we never saw in the OVA, and Schönkopf's flashbacks to living in the Empire). 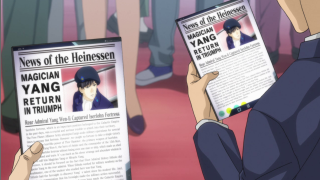 Yang and Schönkopf's plan to take Iserlohn without losing a single man works and is an impressive feat. It's always exciting to see the Thor's Hammer fired off, too. No wonder so many of the FPA's attempts at taking the base failed. Yang's plan managed to lure out the fleet with one move and infiltrate the base in another. Unfortunately, now that he's famed, he'll find it harder to walk away from the military life he dislikes. Next episode looks to return to the Empire, where Oberstein will plead his case to Reinhard and Kircheis will show off his competence. 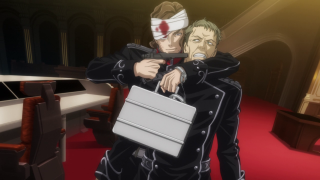 We'll probably get some actual dialogue for Reuenthal and Mittermeyer!